Reading blogs written in my native language, Filipino, always makes me smile. I just admire people who have the patience to write a blog post in Filipino on a daily basis. I must admit that I find it quite hard to gather all my thoughts and write a single entry in Filipino. Perhaps because I grew up speaking a different dialect? I honestly thought that Super Gulaman! is a blog that chronicles about the life of a new Pinoy superhero, born out of a blogger's creative mind. I was expecting a cartoon sketch of Super Gulaman and blog posts about his adventures and misadventures. But when I visited the blog, I was surprised to see that it was entirely of a different nature. It chronicles the life of a Filipino teacher's struggles, what humors and frustrates him, and his thoughts on issues that are directly or indirectly related to the teaching profession. The blog layout is done in black, with a left sidebar that contains some useful links, labels, followers, archives and latest posts. The entries are done in white so that they are still readable despite the dark background. 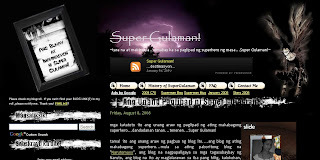 I find the site very easy to navigate too, and found out how the blog came to be in History of Super Gulaman link. If you are in for some refreshing reads, get into the world of Super Gulaman! You'll find yourself enjoying your visit. I did.